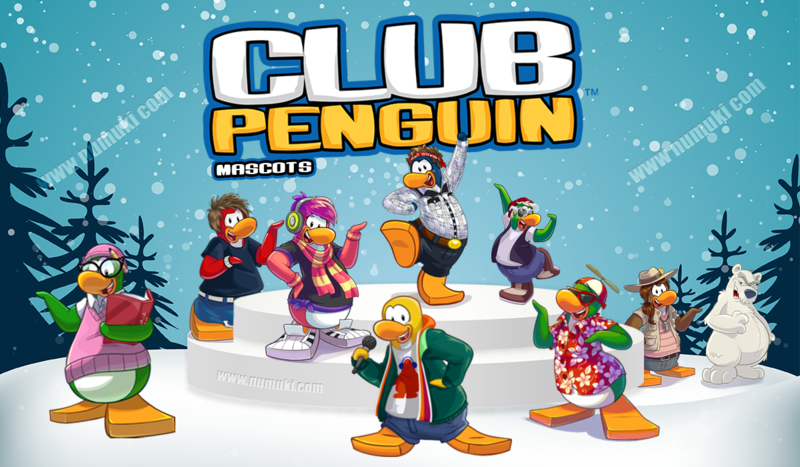 Despite the sobbing closure of the official servers in March 2017, round-the-clock igloo parties continue to make noise in Club Penguin Rewritten. You guessed it, the Disney franchise that amounted 200 million registered user accounts can’t just fade away overnight. Club Penguin has always strived to offer a varied and safe gaming environment for children. This MMO is littered with events, quests, and random trivia, which grants players access to various items. Besides all those Penguin Games, which are always fun to play, what really bring the people together, however, are the Mascot sightings, as every penguin wants to get that fancy stamp! However, since Mascots’ visits are rather rare, and most players have met only a few of them, “How should one increase his odds of encountering any of the Mascots?” you might ask. This is where the Club Penguin Rewritten Mascot Tracker comes into play. Read on for finding more about Mascot sightings and how a specific tracker can actually be used. Mascots are built-in NPC characters which randomly visit the worlds of Club Penguin Rewritten. Upon meeting, each Mascot will grant players a unique background, or items that seem entirely unrelated to this otherwise childish game. A tombstone, for instance. Some Mascots have particular preferences about the events they attend. Thus, the Penguin Band, Franky, Petey K, Stompin’ Bob, and G Billy is most likely to participate in music-related events. Yet, players spotted the band members on Halloween and Christmas parties. Or do it the old-fashioned way, ask around other players. So you think your igloo party is loud enough with the new stereo that you bought? The Penguin Band will quickly change your perspective on what is loud and what isn’t. The band goes – Franky the local guitarist, Petey K the accordionist, Stompin’ Bob and G Billy the drummer. They often visit the island together. Thus, once you see one of the Penguin Band members, be sure to look around for the others. 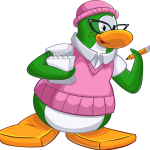 Aunt Arctic is one of the most beloved visiting Mascots in Club Penguin Rewritten, due to her artistic cap and green overalls. She attends milestone events. For instance, Aunt Arctic Mascot will definitely appear on original Club Penguin’s birthday on 24th of October. If you are a writer yourself, then her background is a must for you. Cadence, just like DJ Maxx, is a DJ. You can meet them around music-related events. 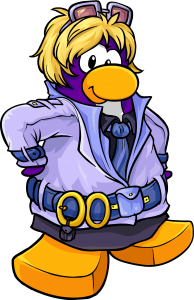 Some Waddle On parties offered players a background of Cadence, most probably because Cadence could not attend the events herself. 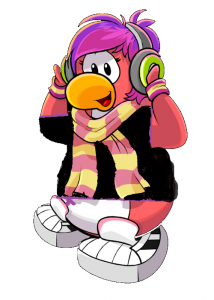 You can recognize Cadence easily as she might be the pinkest character in the game. DJ Maxx, on the other hand, is a bright red penguin, with a quirky look and a pair of headphones. Dot is the disguised master among the penguins of the island. He has one of the rarest backgrounds to giveaway to those lucky enough to meet him. Dressed in white overalls, he is likely to be found on scarcely populated servers. Gary is the local inventor. As one can guess by his white clothes and round glasses, he is mostly away in his laboratory. With an agile mind, he nevertheless likes a good fright, since he regularly attends Halloween parties. Gary is also interested in history, and he is likely to participate in the Medieval Parties. Check its corresponding Club Penguin Rewritten Mascot Tracker to receive guidance on finding Gary’s Mascot. Who knows what secrets his papers he usually carries with him hold? If you take your penguin for a stroll on the shoreline on a lucky day and take a look into the telescope at the Beacon, you can spot an approaching ship. The pirate penguin on board is Rockhopper. 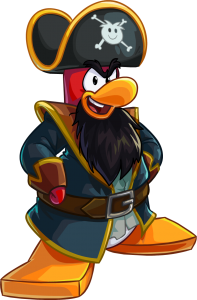 Rockhopper is one of the most frequent guests on the Penguin Island. Trackers managed to locate Rockhopper more than 18 times in 2018 alone. November, however, is not the best month for sailing. The world of Club Penguin Rewritten is alive, and more Mascots are waiting for you to discover them. Herbert the Bear, Puffle Handler, and the goofy Rookie are just a few of them. At this point, you might be wondering where the heck we’ve got this information from. The good news is that there are quite a few websites, like this one, that tracks Mascot sightings all over the servers. It has some extremely in-depth detail on all the Mascots in Club Penguin Rewritten. Every month you can see which Mascot is most likely to visit the island, its usual location and useful tips on how to find it. 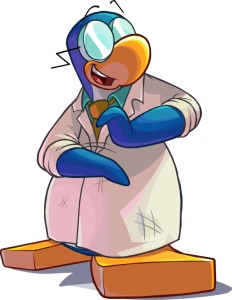 As Club Penguin Rewritten Mascot Tracker suggests, November is the month when Sensei is the most likely to visit. Tracking Sensei is relatively easy if you keep in mind that he is interested in Card-Jitsu. Also, the trackers suggest that you can spot Sensei around the Dojo Courtyard, Ninja Hideout or Cove. Keeping in mind that this November the Card Jitsu Fire event is about to begin, it might be the right time to get Sensei’s stamp! Some trackers also suggest that Dot is also very likely to visit this November. He usually attends EFP events, like Operation Blackout. Aunt Arctic, for instance, hangs around coffee shops and the Book Room. 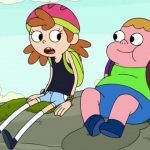 She hadn’t appeared on the island since March 2018. Thus it is safe to assume it might be the time to get out there and receive her background. The Penguin Band is usually easier to find since they typically visit the island along with other band members. They hang around music-related events but almost never can be seen together, except on their giveaway background. If you’re after Rockhopper, check for his ship at the Docks. If you see the Migrator docked, then Rockhopper is most likely on the island. Since we have the jetpack, Jet Pack Guy flies around the island. He attends flight-related events, so if you spot a sporty guy with dark shades, this might very well be Jet Pack. Meet new Mascots and participate in daily events in this living, breathing world. Club Penguin Rewritten is another chance for everyone who didn’t manage to meet all the Mascots before the official servers had closed. Follow the latest trackers, and collect tips on finding the Mascots from real players. Ultimately, when your Mascot hunting plan fails, it might be just as simple as asking around. And by the way, if you are interested in playing more fun browser games produced by Disney, then you should definitely pay a visit to our Disney Games section.